Adobe DNG Converter 8.3.0 set up to convert raw files with unsupported CFA and sensor layouts to demosaiced DNG files. Do not use these settings for raw files natively supported by RawTherapee! Some cameras have sensors with color filter array layouts and sensor pixel layouts unsupported by RawTherapee. 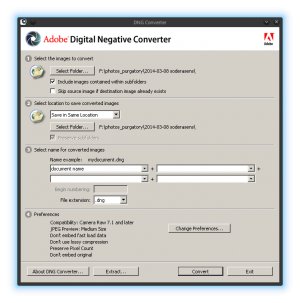 Though you cannot directly process these files in RawTherapee, you can convert them to a supported demosaiced format using the Adobe DNG Converter. These demosaiced files are no longer truly raw, so do not delete your originals! This is merely a workaround.